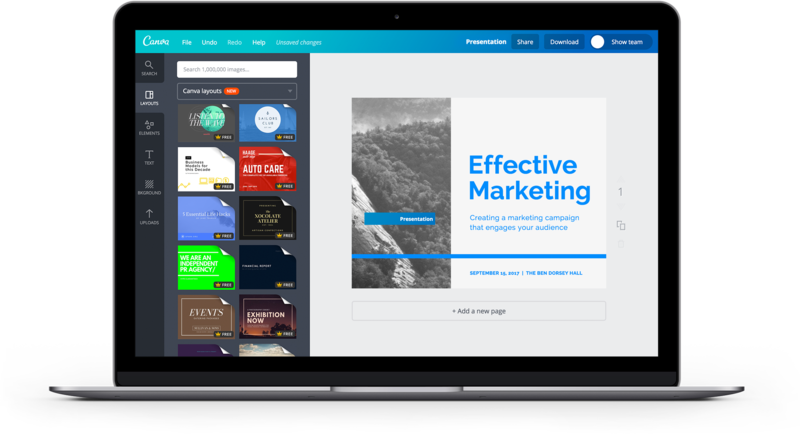 Creating impressive slides is now amazingly simple with Canva’s online drag and drop presentation maker. As a speaker or presenter, your slides can make you or break you. Think of all the presentations you’ve had to sit through where the speaker used unreadable or boring slides with the same, tired design over and over. We’ve got a term for that: death by PowerPoint. Microsoft’s presentation software has long been a standard but if you want to make an impact on your audience, you’ve got to break the mold. Canva’s presentation maker not only looks good, it feels good to use. It’s completely online so there’s no need to download any bloated software. Best of all, it’s completely free. Designing is an absolute breeze thanks to its drag and drop features and ready-made professional quality templates. Everything you need to become a visual communicator is at your fingertips— an epic image library, beautiful graphs and a one-click presentation mode. Create a new Canva account to get started with your own presentation designs. Financial reports, sales presentations, pitch decks should all have different looks and feel. Presentations for church events, school lectures and keynote slides for conferences are again vastly different. So instead of using a generic PowerPoint template, browse through Canva’s stunning collection of presentation layouts to match your industry and theme. Created by our team of professional designers, your slides are sure to look amazing, whether you need it to present a sales proposal, marketing plan or a new architectural project. Just pick the design that best fits your need and use it as your springboard to start designing. As a presenter, you know the importance of including visuals to grab your audience’s attention and underscore a point you’re trying to make. Through Canva, you have access to an incredible media library with over a million professional-quality stock photos, images and illustrations you can simply drop and drag where you need them. Each image is carefully curated and reviewed so they’re sure to look amazing on screen or even on print. Say goodbye to clip art and having to scour Google images! Canva also has a beautiful graphs and charts tool to help you turn your numbers into awesome pieces of data visualization. Open the charts folder and start creating your own bar, line, pie, or doughnut charts. You can also create Venn diagrams, organizational charts and even mind maps. Canva is a completely web-based design platform so you won’t need to download or install any software to get started. And, since your designs are saved on cloud, you can access them anytime from any laptop or desktop. Say goodbye to looking for Microsoft Office everywhere you go! If you want to bring your designs with you on the road, Canva is also available on iOS and Android mobile devices. Just head over to the App Store to get Canva for iPhone and iPad or to Google Play to get Canva for Android for free and start designing on the go. Once you’re done with your designs, it’s simple matter of clicking the presentation mode button and you can go from designer to presenter in a snap. You can even post your new presentation online by clicking the share button and posting it on social media, sending it via email or embedding it into your blog or website.